My eyes are burning. The morning Sun, already 40° high, glares a lemony-orange. It’s meteorologically clear, but the sky looks like paste. What’s going on here? Forest fires! Many in the Midwest, northern mountain states and Canadian provinces have been living under a dome of high altitude smoke the past few days reflected in the ruddy midday Sun and bloody midnight Moon. 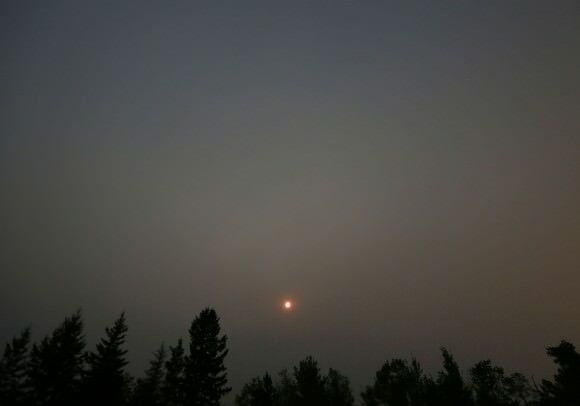 Fires raging in the forests of northern Alberta and Saskatchewan have poured tremendous amounts of smoke into the atmosphere. Favorable winds have channeled the fumes into a brownish river of haze flowing south and east across Canada and into the northern third of the U.S. If an orange Sun glares overheard at midday, you’ve got smoke. Sometimes you can smell it, but often you can’t because it’s at an altitude of 1.2 – 3 miles (2-5 km). But the visual effects are dramatic. Last night, the nearly full Moon looked so red and subdued, it could easily have been mistaken for a total lunar eclipse. I’ve never seen a darker, more remote-looking Moon. Yes, remote. Without its customary glare, our satellite looked shrunken as if untethered from Earth and drifting away into the deep. And nevermind about the stars. Try as I might, I could only make out zero magnitude Vega last night. The camera and a time exposure did a little better but not much. These days of deep red suns in the middle of the day fiery moons at night are an occasional occurrence across Canada and the northern half of the U.S. during the summer. Our previous bout with fire haze happened in early June as a result of massive wildfires in the Northwest Territories and northern Alberta. A change in wind direction and thorough atmospheric-cleaning by thunderstorms returned our blue skies days later. While the downsides of fire haze range from poor air quality to starless nights, the upside is a more colorful Sun and Moon. Back in grade school we all learned that white light is made up of every color of the rainbow. On a sunny day, air molecules, which are exceedingly tiny, scatter away the blue light coming from the Sun and color the sky blue. Around sunset and sunrise, when the Sun’s light passes through the lowest, thickest, haziest part of the atmosphere, greens and yellows are also scattered away, leaving an orange or red Sun. Fire smoke adds billions of smoke particles to the atmosphere which scatter away purples, blues, greens and yellows to turn an otherwise white Sun into a blood red version smack in the middle of the day. Keep an eye on the color of the blue sky and watch for red suns at midday. Forest fires are becoming more common and widespread due to climate change. If you’ve never seen this eerie phenomenon, you may soon. For more satellite images of forest fires, check out NASA’s Fires and Smoke site. I’ve often wondered what it would look like if Earth orbited a red dwarf star instead of the Sun. These smoky days give us a taste. On September 26-27 Cassini executed its latest flyby of Titan, T-86, coming within 594 miles (956 km) of the cloud-covered moon in order to measure the effects of the Sun’s energy on its dense atmosphere and determine its variations at different altitudes. The image above was captured as Cassini approached Titan from its night side, traveling about 13,000 mph (5.9 km/s). It’s a color-composite made from three separate raw images acquired in red, green and blue visible light filters. 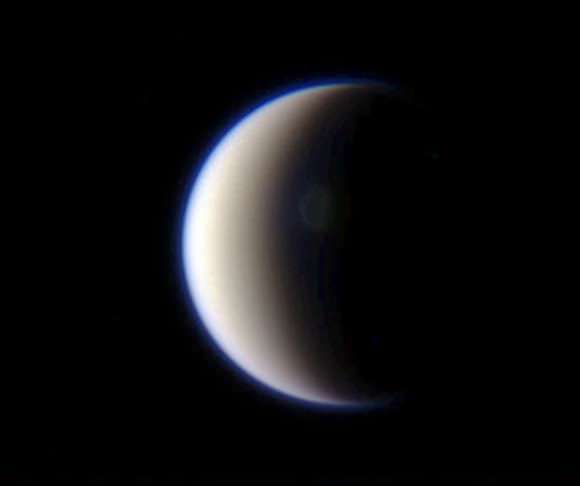 Titan’s upper-level hydrocarbon haze is easily visible as a blue-green “shell” above its orange-colored clouds. Cassini captured this image as it approached Titan’s sunlit limb, grabbing a better view of the upper haze. Some banding can be seen in its highest reaches. The haze is the result of UV light from the Sun breaking down nitrogen and methane in Titan’s atmosphere, forming hydrocarbons that rise up and collect at altitudes of 300-400 kilometers. The sea-green coloration is a denser photochemical layer that extends upwards from about 200 km altitude. In this image, made from data acquired on Sept. 27, Titan’s south polar vortex can be made out just within the southern terminator. The vortex is a relatively new feature in Titan’s atmosphere, first spotted earlier this year. It’s thought that it’s a region of open-cell convection forming above the moon’s pole, a result of the approach of winter to Titan’s southern half. This T-86 flyby was was one of a handful of opportunities to profile Titan’s ionosphere from the outermost edge of Titan’s atmosphere. 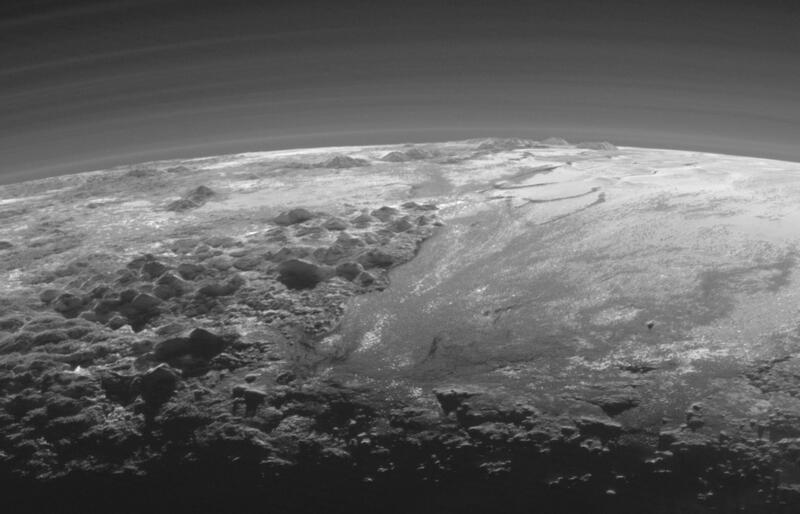 In addition Cassini was able to look for any changes to Ligeia Mare, a methane lake last observed in spring of 2007. Now that Titan has been under scrutiny for a full year of Saturn’s seasons — which lasts 29.7 Earth-years — astronomers now know that varying amounts of solar radiation can drastically change situations both within Saturn’s atmosphere and on its surface. Cassini’s next targeted approach to Titan — T-87 — will occur on November 13. Get more news from the Cassini mission here. Image credits: NASA/JPL/Space Science Institute. All color composites by Jason Major. Images have not been validated or calibrated by the SSI team. Thanks to Cassini’s new vantage point granted by its inclined orbit researchers have gotten a new look at the south pole of Titan, Saturn’s largest moon. What they’ve recently discovered is a swirling vortex of gas forming over the moon’s pole, likely the result of the approach of winter on Titan’s southern hemisphere. What we’re seeing here is thought to be an open cell convection process in Titan’s upper atmosphere. In open cells, air sinks in the center of the cell and rises at the edge, forming clouds at cell edges. However, because the scientists can’t see the layer underneath the layer visible in these new images, they don’t know what other mechanisms may be at work. A stable atmospheric event that’s found here on Earth as well, open cell convection can be compared to the action of boiling water. Titan has already been seen to have a thicker area of high-altitude haze over its north pole, and as autumn progresses toward winter in Titan’s south during the course of Saturn’s 29.7-year-long orbit this may very well be the beginnings of a southern polar hood. An animation of this southern vortex can be found here. Discoveries like this are prime examples of why it was so important for Cassini to have an extended, long-duration mission around Saturn, so that seasonal changes in the planet and moons could be closely observed. New seasons bring new surprises! 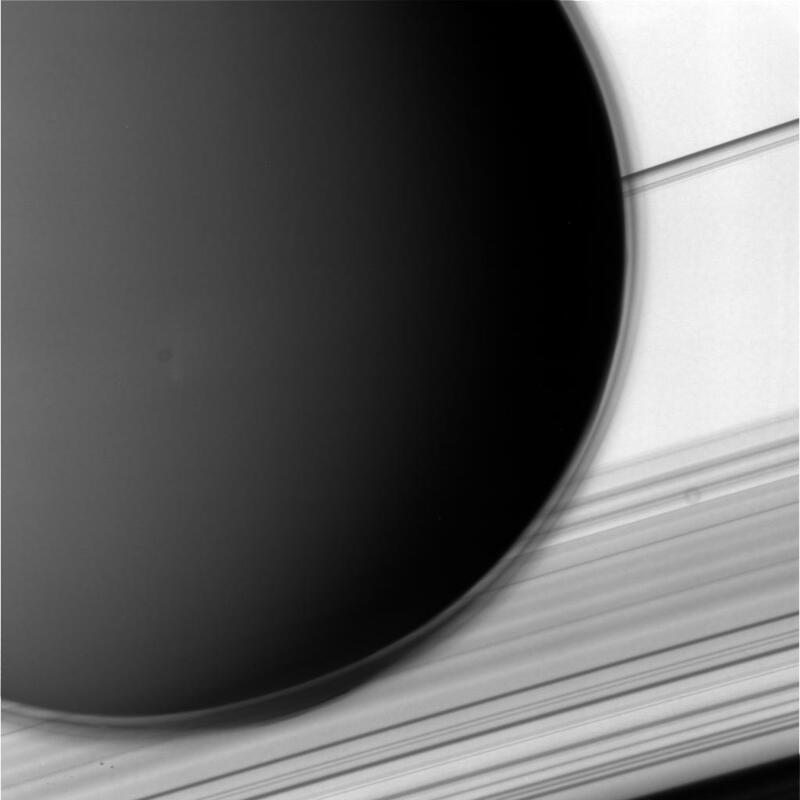 You can find more images from Cassini on the CICLOPS Imaging Team site. Image credits: NASA/JPL/Space Science Institute. Bottom RGB composite by Jason Major. Here’s a quick look at one of my favorite cosmic photo subjects – the varying layers of atmosphere that enshroud Saturn’s enormous moon Titan. The image above is a color-composite made from three raw images acquired by Cassini during its latest flyby. On June 7 Cassini approached Titan within 596 miles (959 km) and imaged portions of the moon’s northwest quadrant with its radar instrument, as well as conducted further investigations of areas near the equator where surface changes were detected in 2010. 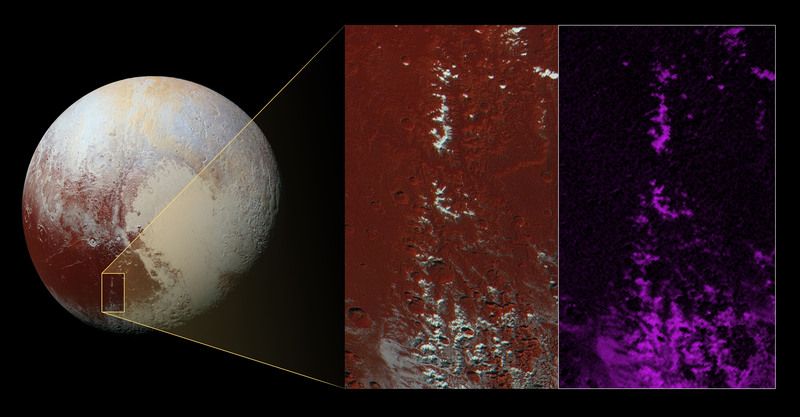 The image here was assembled from three raw images captured in red, green and blue visible light channels. 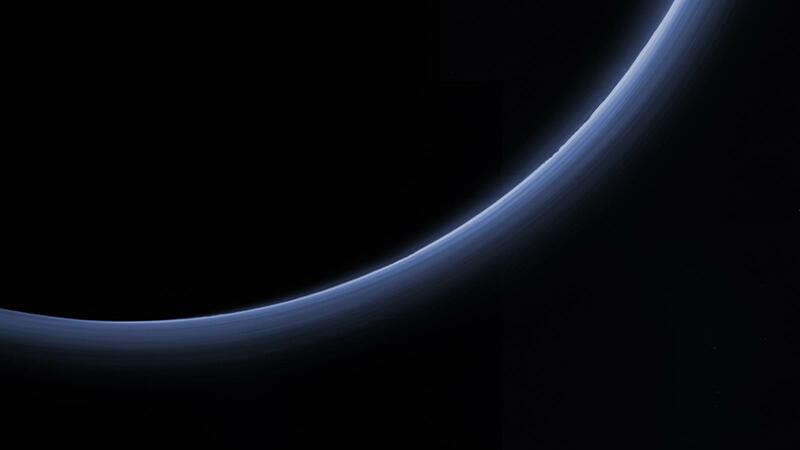 It reveals some structure in the upper hydrocarbon haze layers that extend upwards above the moon’s opaque orange clouds — reaching 400-500 km in altitude, Titan’s atmosphere is ten times thicker than Earth’s! The June 6 flyby was the second in a series of passes that will take Cassini into a more inclined orbit, where it will reside for the next three years as it investigates Saturn’s polar regions and obtains better views of its ring system. Read more about the flyby here. Image: NASA/JPL/Space Science Institute. Composite by J. Major.